Transition to Retirement Income Streams (TRIS) were originally introduced in 2005 to help supplement the income of workers aged between 55 and 64 who reduced their hours or responsibilities as they near retirement. Hence, there is no need for members in this age bracket to ‘retire’ before commencing a TRIS – the member merely has to attain preservation age which is based on a member’s year of birth. Members could commence a TRIS and draw from super the equivalent to 4% of their TRIS balance as an income stream (pension), whilst remaining employed. Prior to 1 July 2017, the superannuation fund itself also derived a tax benefit. Investment income, including capital gains made generated from Fund assets supporting a TRIS were exempt from tax. More often than not this tax benefit was the driver for members to make the decision to commence a TRIS. Members could receive an income stream from super and the Fund itself would pay less tax then it would have otherwise. However, recent changes to the law mean that income from assets supporting a TRIS will no longer be exempt from tax effective 1 July 2017. This means that a Fund that is paying a TRIS is taxed as if the members were in accumulation phase. To understand the tax impact for your Super Fund, we draw your attention to label Y of Section B on page 4 of the 2017 tax return (down the bottom of the page). This label shows the amount of deduction the Fund received for supporting a TRIS. From the 2018 financial year onwards, this deduction may no longer be applicable. Members aged 56 to 59 – the tax free component of the benefit will be exempt from tax, whilst the taxable component will be subject to tax at marginal rates with a 15% tax offset. Members aged at least 60 – the tax free component is exempt from tax, with the taxable component generally being exempt from tax. If you do not require a TRIS to support your lifestyle, you can elect for your TRIS to be stopped. Simply contact us and we can prepare necessary paperwork to effect this change. Alternatively, it may be possible for you to be deemed as “retired” and therefore qualify for another type of pension known as an Account Based Pension – or full retirement pension. A pension that is in operation because the member has actually retired continues to retain the tax exemption in the superannuation fund for the income associated with the assets supporting this type of pension. When am I considered to be retired? A member who attains ‘preservation age’ can access their superannuation benefits upon satisfying the ‘retirement’ condition of release (subject to the governing rules of the fund). 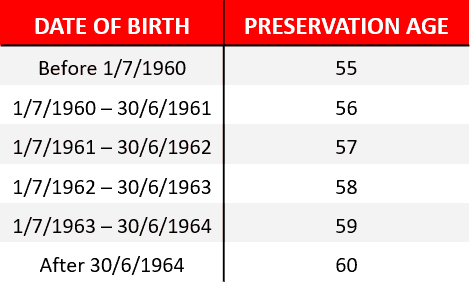 The preservation age depends on when the member was born as per the previous table. the trustee is reasonably satisfied that the person intends never to become gainfully employed on either a part-time or full-time basis (i.e., for more than 10 hours per week). It is not necessary for retirement to have occurred since the member attained preservation age. It can occur at any time, however access to the receipt of a pension is restricted until the member reaches their Preservation Age. The trustee is reasonably satisfied that the person intends never again to become gainfully employed on either a part-time or full-time basis (i.e., for more than 10 hours per week). Therefore, if a member aged 60 or more and is employed by two separate employers, the termination of one arrangement is sufficient for the member to satisfy the retirement condition of release. That is, a member can ‘retire’ for the purposes of the commencing an Account Based Pension by ceasing one employment arrangement, even though they may still remain employed under another arrangement. Turning 65 is an automatic retirement trigger event. Given the potential tax impact to your super fund, you should not just ‘do as you have always done’. It is important to review your circumstances as it may be likely that action on your behalf is required. 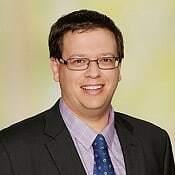 If you would like to know more about the important changes discussed in this article, please contact Brett Griffiths our Superannuation Advisory Director for assistance.